Tomorrow night the COLD WAR KIDS return to Boston to play a sold out show at the Middle East in Central Square, Cambridge. It's been amazing year for the band, its fans and the music.... oh the music! I met the band first at the Middle East on June 6 of last year in an amazing line-up with Tapes N Tapes and The Figurines. It was quite a night. The guys in the band (Nate, Johnny, Matt and Matt) have been playing sold-out shows across the country and making fans out of unsuspecting concert-goers ever since. I have since written about the band a handful of times, and what follows is my review of the Robbers and Cowards album which was released on October 10 as well as some bonus live material. Enjoy - and if you don't have any of their material, now would be the time to click over to their page and pick up the album or one of their EPs! 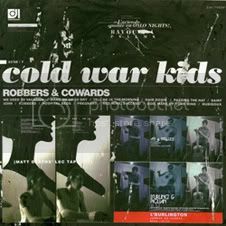 Downtown Records (Gnarls Barkley, Eagles of Death Metal) today release the Cold War Kids' full-length debut, Robbers & Cowards. The album follows the Southern California band's release of three EPs in two years: Mulberry Street, Up in Rags, and With our Wallets Full. Do what you can to get to the record store and pickup Robbers and Cowards today. A "must have." Robbers and Cowards drops today! The thick, layered sound cranked out by this band has proven to leave a strong and enduring impression.Touring and playing with some of world's greatest new bands has bore fruit for the talented foursome. They now find their little indie rock band in some very exclusive company. The CWK's edge may come in unusual time signature drum and guitar pieces accentuated with powerful blues- and gospel-like vocals, piano solos and defining bass. At this point in their early careers -Matt Maust (bass), Jonnie Russell (guitar) , Nathan Willett (vocals) and Matt Aveiro (drums) could already almost be counted as veterans. But this is not the case. What they are is musically tight, talented and dynamic youngsters. And because of this they have evolved and grown with each performance. 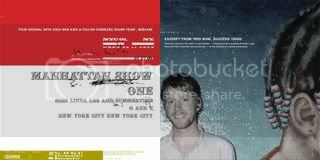 To add more appeal to a Cold War Kids live performance, they have toured with a gallery of independent talent. This list prominently includes: Tapes N Tapes, Sound Team, Figurines, The Futureheads, The French Kicks, Midlake and Two Gallants. The band may have passed another threshold recently. 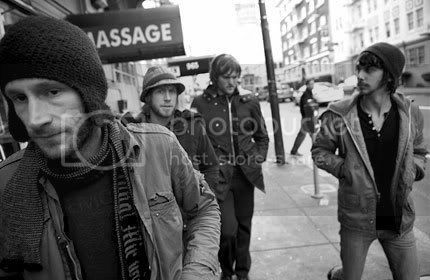 The band appeared in a full-page splash in Interview magazine - A trendy publication which proudly touts itself as "the crystal ball of pop." Success in this case is hardly difficult to predict. As a loyal CWKs fan, I am left with one nagging question: Where the hell are these powerful lyrics coming from? Most musicians their age are writing about loud music or their ex-girlfriends. 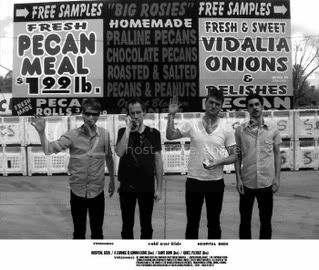 Cold War Kids write with a surprising level of culture, experience and conscience. What band out there is writing songs about strangers laying in adjacent hospital beds? The premise: two bed-ridden strangers are forced to relate to one another because of their common thread - humanity, proximity and fear. Seriously - that's unreal. Cold War Kids don't perform songs about longing - they write about the sensation of being near someone - separated by a pane of glass. The song, "We Used to Vacation" is improbably about the break-up of an adult relationship in which alcohol is the third partner. The listener is meant to understand that to a passive viewer - a child perhaps, the manifestation of this breakup is the fear that there will be no more family vacations; no more good times. Amazing. I just think the Cold War Kids make it easy to listen to the music. A picture I took of Jonnie of the Cold War Kids after a show earlier this year. The backdrop is a mural at the Middle East in Cambridge. It's now up on the band's webpage!